Once again we would like to commend the ISI Group for their extensive work on China. Their latest analysis is showing a correction in the residential housing sector (based on ISI's proprietary index). They are projecting further declines in prices, driven by various new restrictions imposed across a number of cities. 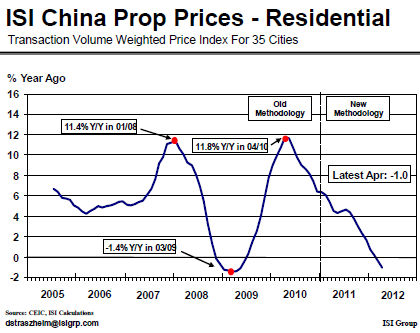 ISI: Group: - China’s housing markets, out of equilibrium, are correcting, with sales and prices weakening. We expect prices to fall in absolute terms, by as much as 10% from their 2011 peak. The break in housing inflation in 2008 reduced prices by about 2%. Beijing would like to see prices fall, not just rise at a slower pace [per China's officials]. Further analysis on property sales (as well as other data) is provided by Patrick Chovanec who is far more negative on China's economic outlook and property markets than the ISI Group. Professor Chovanec: - This year’s April sales also registered a significant month-on-month decline, by -17.2% for all property and -15.5% for housing. The more striking news, perhaps, is that commercial property sales, which have been much more resilient until now, also plunged, with office sales falling -23.4% year-on-year and -34.4% compared to March, and retail property sales falling -9.5% year-on-year and -22.7% month-on-month. Beijing is achieving its target to bring property markets under control. But it also risks the stability of the property development firms who are now a substantial component of China's corporate sector (at least in terms of capitalization and earnings). Furthermore the property market correction will increase pressure on China's banks (discussed here).